Vol. 1, No. 2 of The Equinox, Keep Silence Edition In Proof – Zero Equals Two! We just got word that the proof copy of Vol. 1, No. 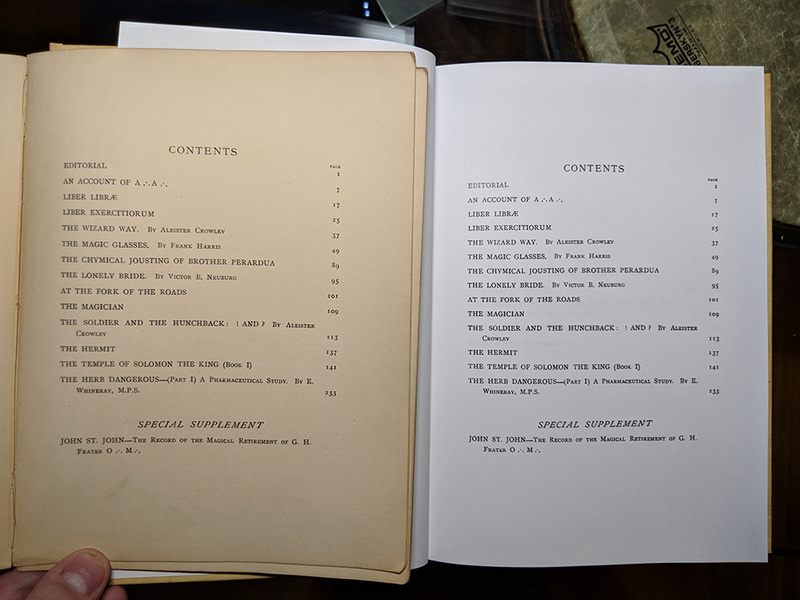 2 of The Equinox based on new digital scans should be winging its way for review and approval to Brother Scott Wilde who is producing editions of all ten issues of the first volume of Crowley of journal of Scientific Illuminism. There are many different editions of The Equinox, the respective issues of this one will be is sold under the title “The Equinox: Keep Silence Edition, Vol. 1” and only be available in hardcover. (link: https://www.barnesandnoble.com/w/the-equinox-aleister-crowley/1128251976?ean=9781642556858) The print edition are based on free digital editions available at https://keepsilence.org/the-equinox as they’re produced. “Do what thou wilt, shall be the whole of the Law. “I first became interested in Thelema when I found the ascii versions of The Equinox that Bill Heidrick (with help from Rusty Sporer, and Fr. H.B.) produced and distributed in the days of BBSs (now available at my good friend Robin’s site the-equinox.org). As a teenager in near rural suburban Minnesota, it was amazing to be able to have access to the sort of material that would continue to inspire me even many decades later. “Heidrick’s editions, while invaluable, were limited by the technology of the day, most notably he was not able to include the images and diagrams, which are so important to the understanding of the text. To compound the problem, later published editions do not reproduce these diagrams very well, some of which are quite detailed and their low quality makes it impossible to read certain bits of text. The 1972 Weiser edition, being produced from high contrast photographs of the first edition is very nice and does not have this problem, but it is prohibitively expensive for most people. Further, certain editions, especially the ascii editions, have many errors in the text itself. “Thus, I am very excited to be able to offer this new edition of The Equinox, it is a completing of a circle in a way for me. Since they are photographic scans, the reader will experience what it is like to read the actual pages of The Equinox, complete with accurate text and crisp high-resolution images. 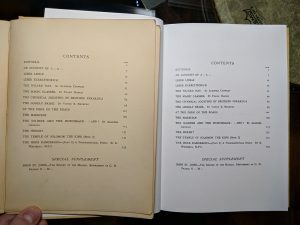 “To accomplish this I bought a first edition set of The Equinox from a collector who says that he bought them decades ago at Atlantis Bookshop in London (he is offering more books for sale over at a facebook group “Good Books” https://www.facebook.com/groups/167789527292891/?ref=br_rs). 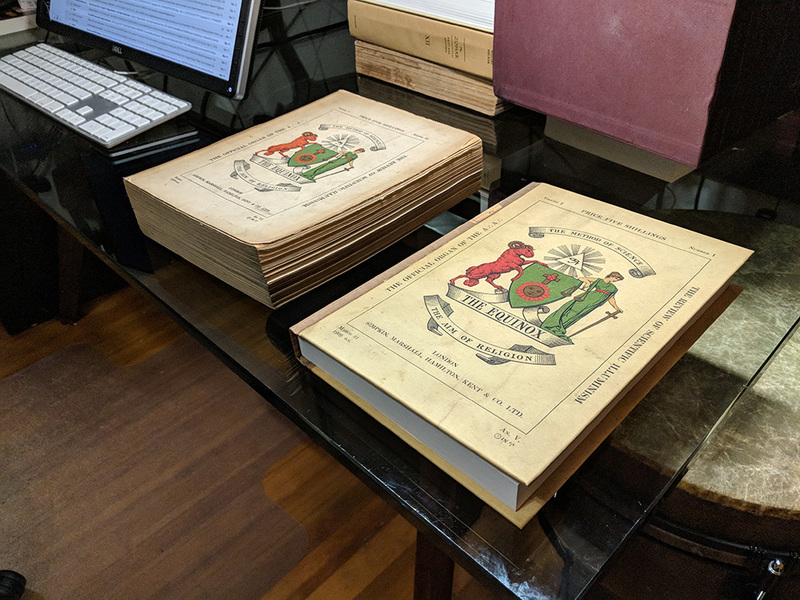 “All of the images used to create the PDFs and print books were created by taking scans of these first editions and then digitally enhancing the black ink and removing the paper texture from the background. The images printed in half-tone are run through a special descreening process to remove the moiré patterns so often seen in digital copies, this actually reverses the original process used to print them and can result in quite a bit of detail being recovered. “This print on demand copy is a good reader copy, it’s printed on #50 paper and the text and diagrams look very nice. If held up to an original, they look almost identical. Even the cover is a close reproduction of the original. I would eventually like to be able to offer a better quality limited edition printed version with better binding and high quality color image reproduction, but that will probably come after I’ve finished with all the scanning and processing work. My chief goal is to make sure this material is available for free on the internet, second to that is make sure that POD edition is always available for cheap. A nice edition is a third, but still worthy, goal. “I’d like to thank Ordo Templi Orientis International, AMeTh Lodge in London, and Horizon Lodge in Seattle for giving me financial assistance for this project. If you’d like to contribute, see the donation page (https://keepsilence.org/the-equinox/donate.html), you can get access to the raw scans or even get your name (or the name of your local body) listed in all the online PDFs. Brother Scott Wilde, Horizon Lodge, O.T.O.